In the spring and fall, gorgeous plants, flowers and trees bloom, and nature seems to come alive after the long, cold winter. Though it paints a beautiful picture in your mind, for many, the warmer season means staying inside, away from trees that release pollen into the air. 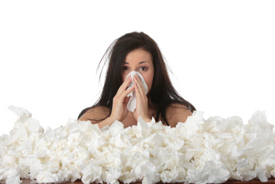 If you have allergies, it’s a difficult time of year for you to go about your daily activities and enjoy yourself. Allergies can result in watery eyes, an itchy throat, fatigue, clogged sinuses, a runny nose and even headaches or migraines, making you feel like you’ll be stuck in your house with the windows closed for months. At Advantage Chiropractic, we offer a personalized approach to health care that examines why your body is reacting to a particular allergen. Often, the top section of your spine in your neck can have a neurological problem that causes your body to misinterpret the allergen, which it then treats as a stressor. Dr. Evan uses a precise technique that is designed to improve your body’s neurology, allowing you to stop attacking the allergen. Depending on your case, it may be appropriate for you to have weekly, biweekly or monthly visits. One of our practice members used to need a pharmacy of products to get by during allergy season. They had multiple nose sprays, eye drops and two allergy medications to try and make it through. After beginning chiropractic care in the last year and improving their neurology, they haven’t needed a single form of medication to fight off their allergies. How you feel today is important, but it’s essential to think of tomorrow, too. You can start moving in the right direction now, knowing that next year, your allergies won’t bother you. Contact Advantage Chiropractic today to schedule a complimentary consultation!